We provide you with new lighting solutions and create value for your business by featuring the state-of-the-art technology to enhance the ultimate energy efficiency. Thanks to antenna expertise and sophisticated software programming, Hytronik sensors are tunable to detection range, full power hold time, dimming level after hold-time and standby time for dimmed level in real applications. 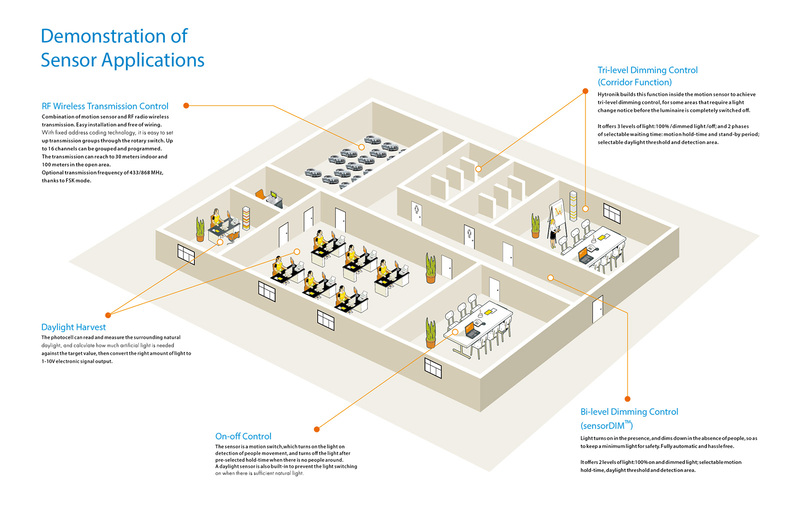 Our output control signals deliver the choices of: On/Off control, bi-level or tri-level dimming control, tunable white and day light harvesting. 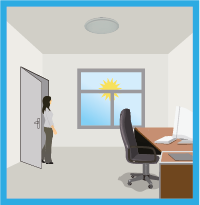 Daylight sensors provides opportunity to set daylight threshold so light is activated only when needed. In many other cases, people do not want to have a sensor to switch on the light automatically, for example, when people is just passing by, there is no need to have the light on. 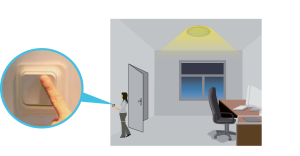 The solution is to apply “absence detection”: by pressing the “M/A” button on the remote control and manual initiation on the push-switch, the motion sensor remains active, turns on and dims the light automatically, and eventually switches it o­ in absence. energy saving, and at the same time, to keep efficient and comfortable lighting. Light does not switch on when presence detected. Short push to activate the sensor and switch on the light. With the manual short press on the push-switch, the sensor is activated and switches on the light. 1- The 1st sensor detects motion, it turns the light on 100% and sends signal to the 2nd sensors at the same time. The 2nd light is switched to stand-by brightness. 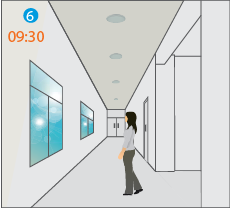 2- The person walks to the 2nd floor, the 2nd sensor turns on the light 100%, meanwhile, the 3rd light is switched to stand-by brightness. 3- The person walks to the 3rd floor, the 3rd sensor turns on the light 100%, meanwhile, the 4th light is switched to stand-by brightness. 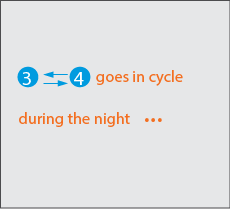 The 1st light is dimmed to stand-by brightness after hold-time. 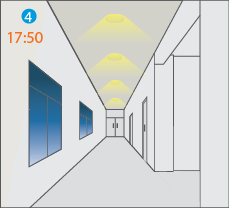 4- The person walks to the 4th floor the 4th sensor turns on the light 100%, meanwhile, the next light is switched to stand-by brightness. The 1st light is off after stand-by period and the 2nd light is dimmed to stand-by brightness. Note: by selecting the Rx buttons on remote control HRC-04, the slave can either turn the light 100% on or dim the light to stand-by dimming level upon receiving the RF signal from the master. 1- With sufficient natural light, the light won’t turn on when motion detected. 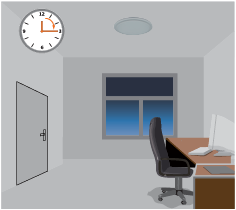 2- After hold-time, the light turns off completely if surrounding natural light is sufficient. 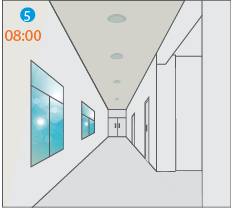 3- When stand-by period is preset at “+∞”, the light will off completely when surrounding natural light is sufficient during stand-by period, and turn on at dimming level automatically when natural light is below daylight threshold. With sufficient natural light, the light does not switch on even there is movement detected. At dusk,as the natural light drops below threshold value, the sensor turns on the light at the dimmed level. The light switches on at 100% when there is movement detected. Light dims to stand-by level after the hold-time. 100% on when movement detected, and 10% on when there is no movement detected. At dawn, light turns off completely when natural light reaches above daylight threshold. Light does not switch on even when movement detected during the daytime. The sensor offers 3 levels of light:100%–>dimmed light –>off; and 2 periods of selectable waiting time: motion hold-time and stand-by period; selectable daylight threshold and choice of detection area. 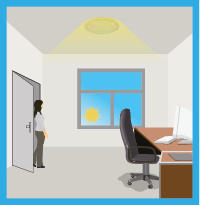 With sufficient natural light, the light does not switch on when presence detected. 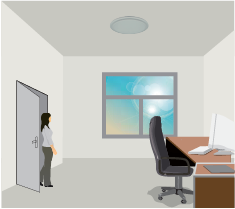 With sufficient natural light, the sensor switches on the light automatically when person enters the room. 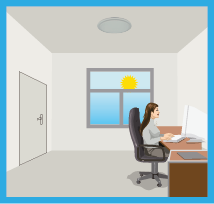 After hold-time, the light dims to stand-by level or turns off completely if surrounding natural light is above the daylight threshold. Light switches off automatically after the stand-by period elapsed. 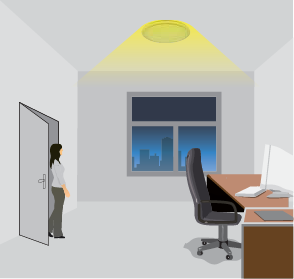 Light will not switch on when the natural light is sufficient even when there is motion detected. Light switches on automatically with presence and the natural light is insufficient The lamp turns on at full or dims to maintain the lux level, light output regulates according to the level of natural light available. 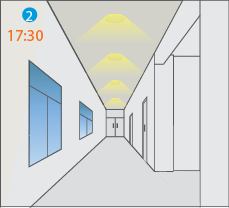 Light will automatically dim down even turn off if the surrounding natural light lux level is above daylight threshold, even there is motion detected. However, if the stand-by period is preset at “+∞”, light will never switch off but dim to minimum level, even when natural light is sufficient. Light will be switched off when the ambient natural light is sufficient. 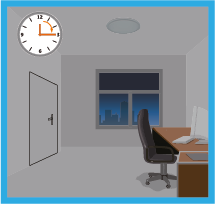 Light dims to stand-by brightness after hold-time, in stand-by period, the light stays on the selected minimum level. Light switches off automatically after the stand-by period. 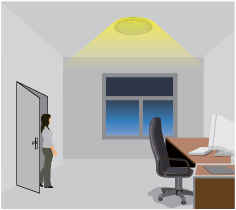 With sufficient natural light, the lights does not switch on when presence detected. With sufficient natural light, the person comes from any direction, the whole group of lights switch on. 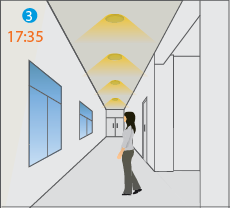 After hold-time, the whole group of lights dim to stand-by level or turns off completely if surrounding natural light is above the daylight threshold. After the stand-by period, the whole group of lights switches off automatically. This is an integrated motion detection LED driver, it turns on the light on detection of movement, and turns off after a pre-selected hold-time when there is no motion detected. A daylight sensor is also built-in to prevent the light switching on when there is sufficient natural light. With insufficient natural light, the light does not switch on when presence detected. 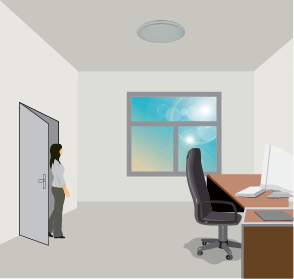 With insufficient natural light, it switches on the light automatically when person enters the room. The sensor switches off the light automatically after the hold-time when there is no motion detected.